10:23: Rather than engaging in a philosophical debate about the role of government and how it could be run better, both candidates use the last formal section of the debate to return to basic policy positions on issues like education. They do not have a substantive discussion about how to manage government better. 10:18: Romney on his view of government: "I do not believe in cutting our military." Important "not to have the government substitute itself for the rights of free individuals." Uses "trickle-down government" phrase again. 10:15: Obama defending government: "The first role of the federal government is to keep the American people safe." Also: "The federal government has the capacity to ... create ladders of opportunity." Quotes Lincoln: There are some things we can do better together. 10:13: Here comes the role of government stuff. 10:08: Romney on health care: "The right answer is not to have the federal government take over health care." 9:55: Obama: "Is there anyone out there who believes that there was too much oversight and regulation of Wall Street?" 9:52: Romney: "In some of the legislation that's been passed during the president's term, you've seen regulations become excessive." 9:42: Obama touting reductions in overpayments in Medicare. 9:38: Romney on states as "laboratories of democracy:" "Don't have the federal government tell everybody what kind of training programs they have to have, what kind of Medicaid they have to have." 9:29: Obama makes his first reference to cutting federal programs, touting proposals that were included in his budgets. 9:23: Obama hitting Romney for proposing $2 trillion in defense spending that "the military hasn't asked for." 9:14: Romney: "I'm not looking to cut massive taxes and reduce revenues that are going to the government." Also: "I won't put in place a tax cut that adds to the deficit." 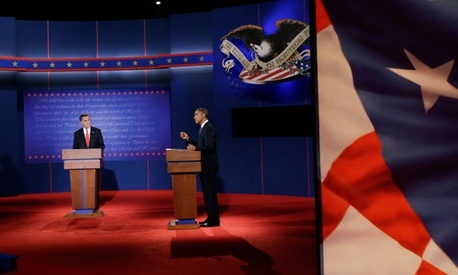 9:12: Interesting that in the straight-on shots of both candidates, this phrase from the Declaration of Independence appears on the backdrop behind them: "That to secure these rights, governments are instituted among men, deriving their just powers from the consent of the governed..."
9:09: Romney on Obama's approach: "trickle-down government." Obama doesn't directly respond. 9:02 pm ET : Interesting that "the role of government" is a formal topic category of the debate. I think that's a first.